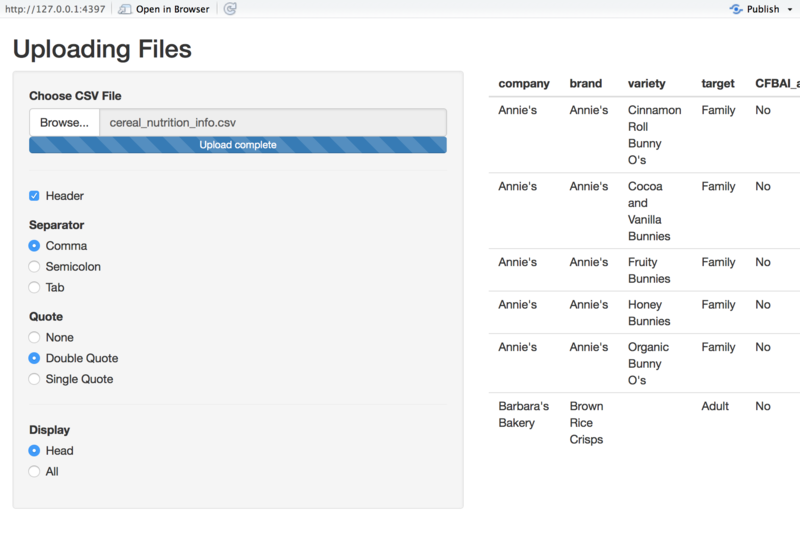 Sometimes you’ll want users to be able to upload their own data to your application. Shiny makes it easy to offer your users file uploads straight from the browser, which you can then access from your server logic. This feature does not work with Internet Explorer 9 and earlier (not even with Shiny Server). By default, Shiny limits file uploads to 5MB per file. You can modify this limit by using the shiny.maxRequestSize option. For example, adding options(shiny.maxRequestSize = 30*1024^2) to the top of app.R would increase the limit to 30MB. File upload controls are created by using the fileInput function in your UI. You access the uploaded data similarly to other types of input: by referring to input$inputId. The fileInput function takes a multiple parameter that can be set to TRUE to allow the user to select multiple files, and an accept parameter can be used to give the user clues as to what kind of files the application expects. This example receives a file and attempts to read it as comma-separated values using read.csv, then displays the results in a table. As the comment in the server function indicates, inFile is either NULL or a dataframe that contains one row per uploaded file. In this case, fileInput did not have the multiple parameter so we can assume there is only one row. The file contents can be accessed by reading the file named by the datapath column. See the ?fileInput help topic to learn more about the other columns that are available.